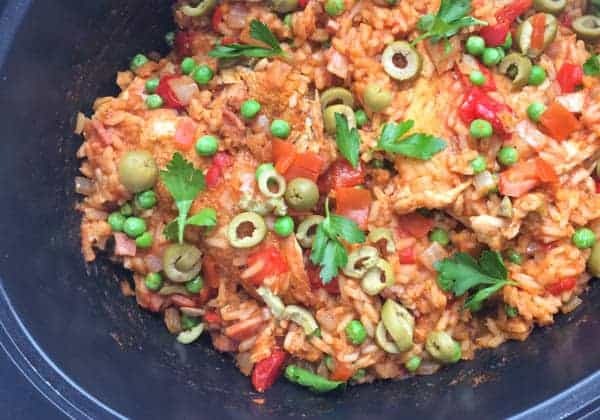 Perfect for busy weeknights, transport your taste buds around the world with this easy, healthy and delicious Slow Cooker Arroz Con Pollo. This recipe is not only easy to make but is great for using up ingredients you likely already have on hand such as tomato sauce, rice, chicken and frozen peas. Slow cooked dinners are my jam all year round but I especially love using my slow cooker in the summer months when it’s too hot to turn on the oven or stand by a hot stove for an hour. We happened to have a package of split chicken breasts to use up but chicken thighs or boneless tenderloins would also work well. For a Spanish twist, the chicken and rice is flavored with traditional spices including turmeric, cumin and saffron. If you don’t have a few of the spices listed, just skip them. Frankly, it would be delicious with just salt and pepper. To maximize the flavor of the chicken breasts, I gave them a quick sear using the insert of my stove-top safe slow cooker. You can always use a traditional stock pot or Dutch oven as well. Whenever I serve a slow cooker dish, I like to add a couple fresh ingredients to brighten up the dish before it’s time to plate. Parsley and green olives are sprinkled on at the last minute to add a fresh flavor to the slow cooked meal. Another splash of lime juice wouldn’t hurt either. 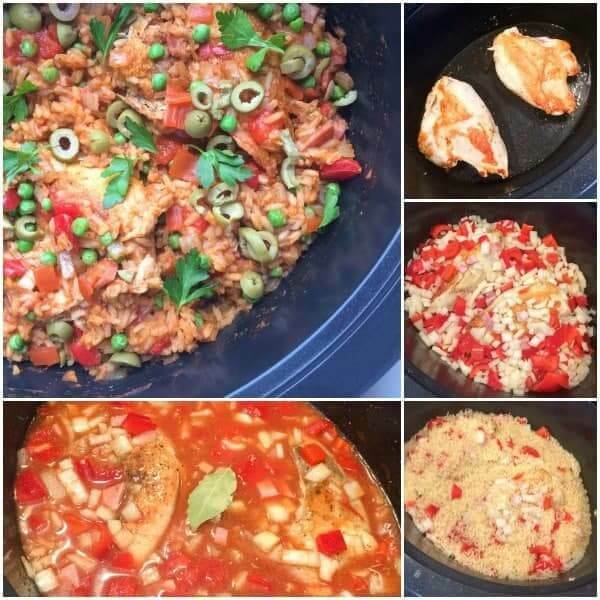 Easy to make and great for using up ingredients you likely already have on hand such as tomato sauce, rice, chicken and frozen peas. Turn off heat and add the next 13 ingredients to the slow cooker (onion through cayenne). Stir well and heat on High for 3-4 hours or Low for 5-6 hours. Fluff rice with a fork and stir in peas 10 minutes before serving. Garnish with green olives and fresh parsley to serve. 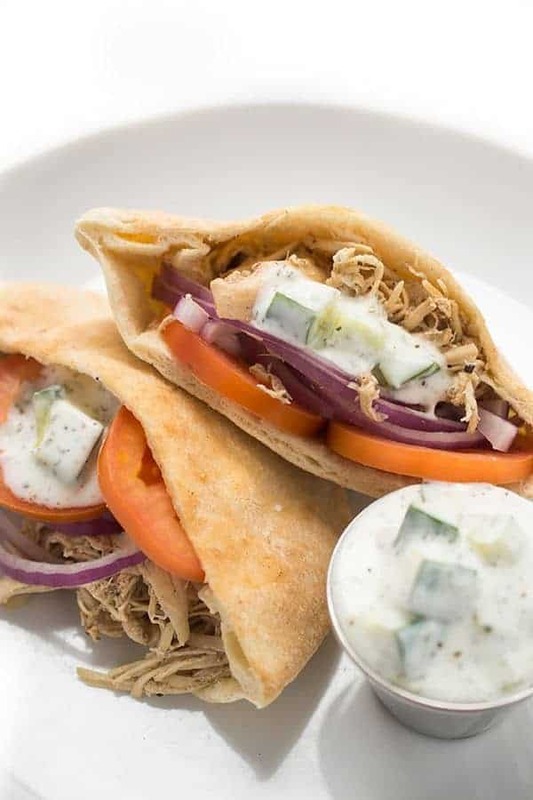 My Healthy Slow Cooker Recipes board has some more great ideas. Pin away! I loved the flavor of this dish, but the rice itself got too gummy after 5 hours in the slow cooker. I think if I made this again, I would cook the recipe separately and add it at the end, with the peas. It may be the rice! Another idea is to try rinsing it! I’m in the midst of a kitchen renovation and don’t have a stove. Can I throw the chicken in without searing first? Thanks! I asked my husband to pick me up chicken thighs. I meant boneless and skinless, but he came back with thighs on the bone and with skins. I thought to myself, what lends itself to that type of meat? (obviously I can de-bone them and peel the skin myself, but nah) It came to me: Arroz con pollo! Y So i googled it up. Your recipe says breasts, but I don’t care. Of the five recipes I looked at, I like yours the best. So, it’s in slow cooker now. It will be awhile and my rice is in there too. Bbut the thing is, I like mushy rice just fine, so I don’t care if it comes out that way. I didn’t have tomato sauce on hand, so I used a can of diced tomatoes. I’m thinking of adding capers at the end because I have them and they just sit in the fridge useless. Plus I don’t like peas. Do you think that’s a bad idea? I’ll check back later for your answer. I still have hours on this dish. Sooooo, I’m really happy to find this recipe and thank you. I can tell already it’s going to turn out great! Looks great and smells great right now. 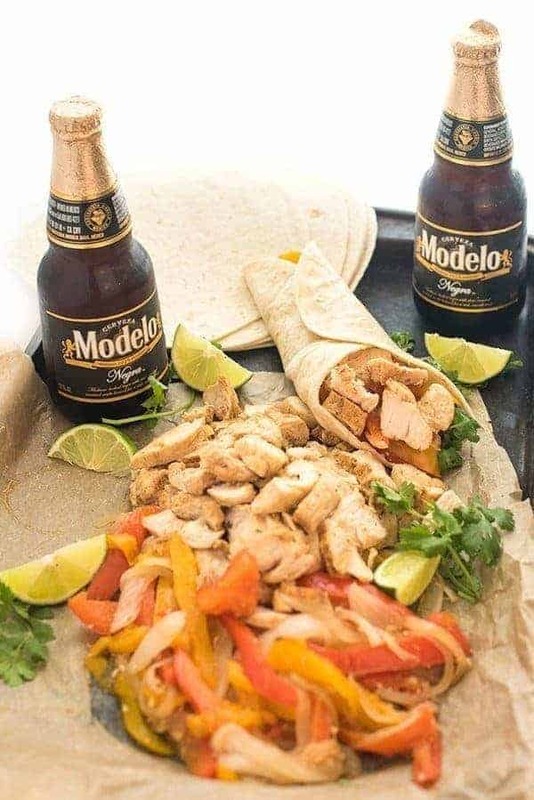 How did you know arroz con pollo is my go-to dish at my favorite Mexican restaurant!!?? I never even thought about making this in the slow cooker! Hooray. This recipe was delicious, it will be a regular for our house. Loved the olives and I put cilantro instead of parsely for garni on the plates when I servced it. My rice was pretty mushy, but I blame my crockpot because it really overcooks things. Next time will probably put rice in later. Thanks for the great tastes in this recipe! I’m so glad you enjoyed it!! I have found the rice cooking time does vary a bit based on strength of slow cooker so good idea to try and add it later. Glad the flavor was good! Excited to try this! Do you think substituting with long grain brown rice will work? Yes I bet it would! Thank you! Made it (with brown rice) and it was delicious! This was absolutely wonderful! My boyfriend is a professional chef and he raved about this dish…said the flavors were perfectly balanced… and asked for seconds! Oh my gosh I’m so glad to hear that!! Thank you Robin!! I make this all the time now and it is always amazing! Due to my Chef’s unpredictable schedule, I have begun cooking the rice separately, using the wonderful broth from the crockpot in place of water. That way the rice is never overcooked, and the flavors meld beautifully. Thank you again for a lovely, lovely recipe! That is such a BRILLIANT idea!!!!! Thanks so much for sharing Robin!! Well, the chicken tasted delicious, but the rice was really overcooked and soggy. Perhaps adding the rice one hour in to the cooking time may help…? Oh no! I’m so sorry your rice was overcooked. Did you make any adjustments to the other instructions or liquid amounts? Sometimes even just a little too much liquid can make a big difference. Either way I hope it was still flavorful for you – sorry again! So glad to hear!! Thanks again for the helpful feedback! Just added to my meal plan for next week!! Thank you Liz – sounds really nice. Wow, this looks awesome! What a hearty and healthy meal! Love the nutrition count on this as well. I think I need to get the slow cooker out this weekend! This would make a great Sunday dinner with leftovers. Let me know if you try it!! I hope you love it!! Oh yummy!! This looks really good!! It makes me hungry! Looks delicious. I absolutely LOVE that this is made in the slow cooker. Love using the slow cooker for easy meals. Can’t wait to try it. I love anything that saves me time at the dinner hour!! Thanks Stephanie! In the words of Rachael Ray… YUMMO! I’m loving the flavor profile of this dish, it’s right up my alley! My 3 boys love MEAT so the slow cooker is one of my favorite options aside from grilling of course.